Laparoscopic total extraperitoneal (TEP) inguinal hernioplasty is significantly less painful than open repair, but it is not completely painless. Local anesthetics are thought to decrease postoperative pain when placed at the surgical site. 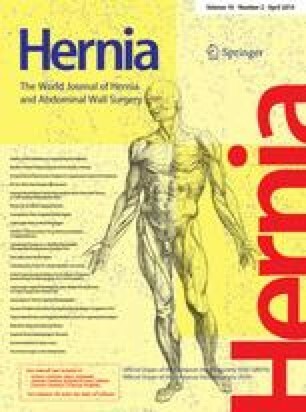 We conducted a systematic review of randomized controlled trials (RCTs) to evaluate the efficacy of extraperitoneal bupivacaine treatment during laparoscopic inguinal hernia repair for the reduction of postoperative pain. We conducted a systematic review and meta-analysis of RCTs that investigated the outcomes of extraperitoneal bupivacaine analgesia versus control in laparoscopic TEP hernia repair. Pain was assessed using a visual analog scale at 4–6 h and at 24 h following the surgery. The secondary outcomes included complications and analgesia consumption. We reviewed eight trials that included a total of 373 patients. We found no difference between the groups in postoperative pain reduction following laparoscopic TEP inguinal hernia repair. The intensity of pain was not significantly different between the bupivacaine treatment group and the control group. The pooled mean differences in pain scores were −0.26 (95 % CI −0.72 to 0.21) at 4–6 h and −0.47 (95 % CI −1.24 to 0.29) at 24 h. No bupivacaine-related complications were reported. Extraperitoneal bupivacaine treatment during laparoscopic TEP inguinal hernioplasty is not more efficacious for the reduction of postoperative pain than placebo. The authors have no conflict of interest or financial ties to disclose.